Congress and TDP seems to be having a secret understanding for 2019 General Elections. Never been before the rival parties moved so closely in the Parliament. While Congress backed the No Confidence Motion moved by TDP, TDP voted in favour of Congress Candidate in Rajya Sabha Deputy Chairman election. AICC Chairperson Sonia Gandhi has lauded TDP MPs for their fight against NDA Government in the Parliament. Particularly, She was all praise for Chittoor TDP MP Siva Prasad who protests in various get-ups. These developments indicate few TDP Leaders have been in touch with Congress High Command regularly. 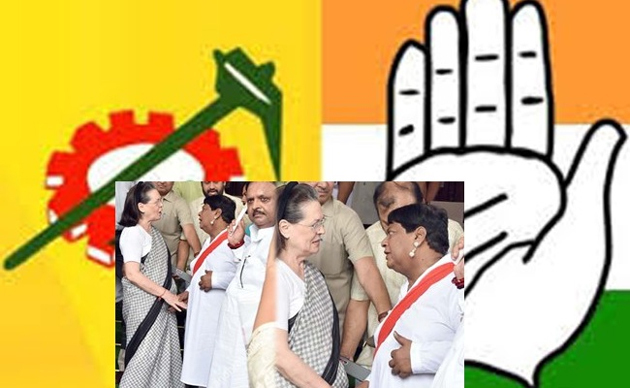 Until recently, TDP used to project Congress as Accused No.1 for bifurcation. After the end of alliance, It had replaced Congress with BJP. TDP Leaders defend themselves saying, 'Congress has done injustice to AP and there are no second thoughts about it. But now, What's being done by BJP is even more harmful. That is why we have been joining hands with Congress to defeat BJP'. Few TDP Leaders haven't been able to digest the unethical tie-up with Congress against which party NTR fought thoughout his political career. Still, Chandrababu Naidu is keen to have an understanding with Congress for 2019 Polls.